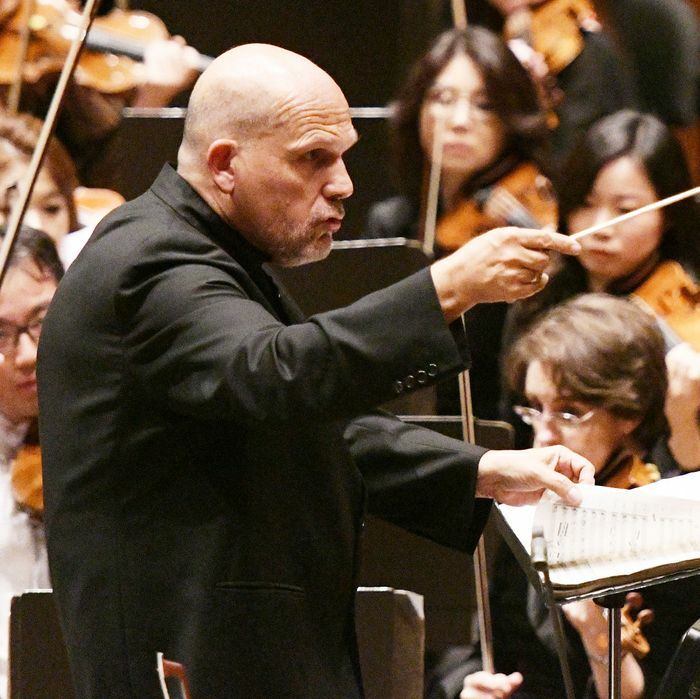 The New York Philharmonic usually opens each season with “The Star-Spangled Banner,” but in his first concert as the orchestra’s music director, Jaap van Zweden decided to skip the anthem — probably not out of solidarity with Colin Kaepernick, but because it would have ruined the effect of the first piece on the program, Ashley Fure’s new Filament. And what an effect! A rush of white noise whipped around the hall and exploded into a snarling chord. Fure is a virtuoso of noise, and I wondered how her choreographed clangor would strike a gala audience primed for a celebratory launch. I needn’t have worried: Filament roared, and when it was done, the crowd roared back. Fure is a revelation, but not a newbie. Last month, the Mostly Mozart Festival presented The Force of Things: An Opera for Objects. Subwoofers that hummed below the audible range communicated their vibrations to paper sheets suspended around a room. The quivering drapery rustled like a breeze in the woods, except that after a moment the whispers began to sound rhythmic and intentional, as if the vegetation had something urgent to say. I heard that piece soon after reading Richard Powers’s The Overstory, an astonishing novel about trees and the people who love them, and I suddenly felt like one of his characters, eavesdropping on a great conclave of aspens as they gossip outside the range of human comprehension. Filament is nominally a more traditional work: An orchestra onstage plays for an audience seated before it, and sometimes it even sounds like that. But Fure is a genius at transforming familiar bits of the world — a scrape, a gust of air, a violin — into a mysterious sonic menagerie. Three soloists — trumpet and double-bass players onstage and a bassoonist on a platform in the middle of the hall — make their instruments sizzle and snap. They toss these amplified fragments over the heads of both orchestra and audience. A choir scattered around the balconies whispers and hums into specially designed megaphones that look like high-tech conch shells. The orchestra produces gusts, clatters, resounding chords, and cloudy tremolos. But describing the mechanics does little to evoke the score’s vast, deep, and layered landscape of noise. This is what an alpine valley must sound like to Superman: each creature’s squeak and wildflower’s shiver made present and vivid, yet distinct enough to prevent a chaotic roar. New music is absorbing nature again, as it finds a new way to do in every century. John Luther Adams, a New Yorker by way of Alaska, sculpts swells, deserts, and windstorms of sound. As it happens, an hour before the philharmonic concert, I heard the vocal ensemble the Crossing perform Ted Hearne’s powerful and entertaining new “Animals” at Park Avenue Armory. In that piece, singers mimic a chorus of howler monkeys, chattering birds, and excitable coyotes. The only intelligible words come from the president of the United States: “These aren’t people, these are animals,” a reference to the allegedly violent immigrants his administration is deporting as fast as it can. Like much of Hearne’s music, “Animals” is a political piece, intimating that the eloquence of beasts can surpass our own — it’s our problem if we can’t understand them. Fure, too, suggests that if we listen to the natural world with more acutely tuned ears, we will find an unsuspected wealth of stories. In the second half, van Zweden conducted Stravinsky’s Rite of Spring, wielding his baton like a blade he’d been patiently whetting all summer. It flicked and flashed, and the orchestra answered with diamond-edged beats, accents so sharp they could impale a punching bag, and more than one fff that cut off into violent silence. Rite of Spring churns together brutality and refinement, tenderness and bravado, and the most moving performances I’ve heard give the listener room to breathe between passages of gut-punch syncopations. Van Zweden’s version had no respite. He transformed the orchestra into an ensemble of guillotines, fabulously precise and even nervously exciting, but ruthless. Maybe he also commands a fuller range of nuance, smoky half-shades, ambiguity, and grace, but we haven’t heard those yet. It was not reassuring that, for an encore, he led a rendition of “Ride of the Valkyries,” which blared so cartoonishly that the conductor seemed to be thinking not of Wotan’s daughters but of Elmer Fudd.